Net flows into European sustainable investment funds during the first half of 2018, were at their second highest level of the past five years. 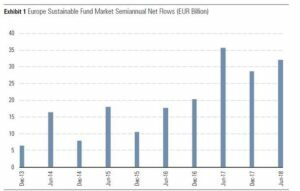 Figures from Morningstar show that European sustainable funds saw net inflows of €32.1 billion in the first half of 2018, up from €28.8 billion in the previous six months. It is only the second time in the past five years have net inflows have exceeded €30 billion in any six-month period. That was in the first six months of 2017, when net inflows exceeded €35 billion. She explained: “The universe of sustainable investment funds in Europe continued to grow in the first half of 2018, making it easier than ever to invest for sustainability and impact. The Morningstar research report found that a total of 77 new open-end funds and exchange-traded funds were launched between January and June including seven index funds and 10 ETFs. By asset class, 33 were equity funds, 10 were bond funds and 29 were allocation funds. A further five were funds in the alternatives sector. Bioy’s analysis recognised recent launches by RobecoSAM, Legal & General, Lyxor and Xtrackers and added that asset managers have also been adding sustainability criteria to their existing funds as the investment appeal widens. “This was the case in March for Franklin Templeton, which repositioned its Templeton Global (Euro) Fund to the Templeton Global Climate Change Fund,” she explained. “The new fund aims to invest in attractively valued companies preparing for the transition to a lower-carbon economy. “Repurposing funds to have a sustainability mandate allows asset managers to leverage existing assets to build their sustainable-funds business, thereby avoiding having to create funds from scratch and, in some cases, accelerating the time frame required to reach scale.